He gambled and won: Ravens sign free agent Earl Thomas to a 4-year deal worth up to $55 million. Seahawks use some savings to hire PK Jason Myers. 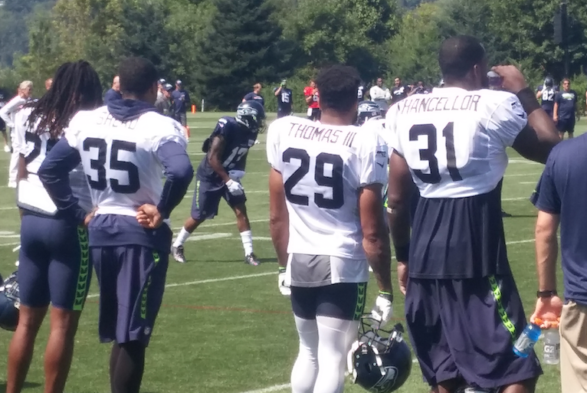 Good thing Earl Thomas didn’t retire when he first thought about it. After the stun faded, teammates and coaches quickly dismissed Thomas’s retirement suggestion as an impulse after the first serious injury of his football life. “All of us consider retirement just about every game,” Richard Sherman said. “And when you get an injury like that, a lot of stuff goes through your mind. The description proved true. Fortunately, for all. Had he acted on his impulse, he would have missed out on his big day Wednesday: A free agent signing with the Baltimore Ravens for four years, worth up to $55 million, with a whopping $32 million guaranteed. After a tumultuous 15 months in which he told a rival coach to “come get me,” held out of training camp and preseason, then played well, only to break his other leg and abruptly offer his public goodbye to club management with a middle finger seen around the world, the hard feelings evolved into the softest of landings for Thomas. As free agency approached, Thomas insisted — again sounding impulsive — that his third contract be the best in the NFL for his position despite being 30 in the fall, and coming off injury. The Ravens’ offer came close enough — the deal Washington just gave Landon Collins was worth up to $84 million over six years, also $32 million guaranteed, for a player five years younger — that Thomas can call it whatever he likes and no one will care. Even though the free agent market for safeties became crowded with top talents, his strategy won the day. The Seahawks are likely left with a third-round compensatory draft choice in 2020 and the knowledge that, given other big contract priorities, the bosses could not have afforded Thomas even if they wanted to. But coach Pete Carroll and general manager John Schneider didn’t want to, just as they didn’t want to with Sherman and Marshawn Lynch, stars like Thomas who still had game left. All three were integral in advancing the Seahawks to the NFL’s top shelf, and all three ended their Seattle careers after conflicts with management primarily over money. That’s the way it works across the NFL. Players want their history of success to be rewarded, and teams are equally insistent that rosters, in an industry with a hard salary gap, perpetually must get younger and cheaper. We’ll likely never know with each star what factor was paramount — age, health, money or truculence — that led to their departures. We do know that the Seahawks don’t want another episode like Kam Chancellor’s, where an injury following a third contract sticks them for multiple years with a sunk cost for a player in decline. More room under the cap allows the Seahawks to do things like solve their place-kicking problem, which they did Wednesday when they signed fifth-year pro Jason Myers to a four-year deal for $15.5 million, with $7 million guaranteed, according to the New York Daily News. After dithering on the cheap with kickers Blair Walsh in 2017 and Sebastian Janikowski in 2018, the Seahawks spent for the top guy in the market. A $4 million annual average is a lot for a kicker, but one rationale stands out: Myers, whom the Seahawks cut in preseason and was hired by the Jets, was good on an NFL-record five field goals of 55 yards or longer. The Seahawks last season lost four games by three points or less, including the playoff game 24-22 at Dallas, where Janikowski missed from 57 yards just before halftime. A made field goal there would have been worth $4 million by itself. Hiring a long-distance kicker in his proven prime at 27 (he hit on 33 of 36 field goal attempts to lead the league in percentage) means points on several drives every season that would be otherwise scoreless. Smart move. The departure of Thomas has deeper significance for other pending decisions: Whether to extend LB Bobby Wagner as he enters his contract year, the same situation the Seahawks face with QB Russell Wilson and DT Jarran Reed. And pass-rushing DE Frank Clark has yet to sign his franchise tag, in hopes of getting a long-term extension. While Wilson’s future merits most attention and is a world nearly unto itself, Wagner, 29 in June, is nearly as important to the defense as Wilson is to the offense. Reed is 26, as is Clark in June. The three are the future of the defense. Devoting cap room to their deals that otherwise could have gone to Thomas makes more sense. As much as Thomas has meant to the Seahawks as a once-a-decade safety on par with the NFL’s best in Kenny Easley, Ronnie Lott, Troy Polamalu and Ed Reed, there is a simple way to see it: His decade has come to pass. He was splendid. Health permitting, he’ll be great for the Ravens. Glad he talked himself out of retiring. Thiel: Seahawks still ‘elite’; hear that, Russell? I can’t hate Earl Thomas, even for giving the team the finger (even if it were a juvenile move made in a highly emotional moment). I’m bemused by the PK signing – I guess, all of a sudden, we should pay a good kicker rather than just hope for the best? That’s a change from past behavior. Fluker (Bang Bang, he is the warrior) will cost more than the Seahawks wanted to pay; Clark is looking at the deal Dee Ford got as a comp (5 year, $87.5mm, although I haven’t seen what the guarantee is) and will want a tad more; and then there’s the lively leprechaun that plays quarterback and his $35mm/year upcoming deal. It’s going to be a strange off-season. Time for some wavy gravy. Every year for every team, it’s more or less the same, with the exception of those handful of teams with a premier QB at the top of his game. Many structural members must be bent or replaced to accommodate. Don Martindale, D.C. of the Ravens, just let out a giant exhale that was so big that the trees swayed in my back yard. Earl fits well in their system/philosophy and let’s hope he has a healthy time there and the fans enjoy his play like we did before . . . well . . . whatever. Be healthy, Earl—we respect your time here and some day you’ll be raising that 12 flag and being commemorated to the exultation of all. Earl would fit any system. I hope his good health prevails too, and people in this market welcome him back. To me it’s interesting how the LOB ended their Seahawks careers. Earl’s obnoxiousness got the team to pass on negotiating with him for a contract extension, Richard Sherman’s obnoxiousness got him waived, Kam Chancellor held out in the first year of a contract extension for two games in 2015 then in the first year of a three year $35 million contract extension in 2017 he suffered a career ending injury and sadly Brandon Browner is serving an 8 year prison sentence for attempted murder. Tell this group that this would be their futures back in 2014 and they’d scoff at you. I doubt that the Carroll/Schneider football brain trust will again be so loyal to players anymore. This group was expected to lead the franchise to multiple championships but instead imploded after only one. Wish I could say that I’m surprised that a team gave Earl so much, especially guaranteed but little in professional sports surprises me anymore. Wish he gave the Seahawks a chance at doing something. On that note to paraphrase MLB pitcher Pedro Martinez you just gotta tip your hat to Earl and call him daddy. Don’t know exactly when his relationship with the Seahawks soured but for a time he gave the 12’s some great memories. I didn’t see any implosion, just the usual attrition and contract squabbles typical of every NFL team. I don’t think any player, asked asked as a rookie to forecast how his career will play out, would get 10 percent of it right. It’s all so random. Regarding Earl, he wanted more money than the Seahawks felt they could pay. He took it as profound disrespect, which was his error, but he played his hand and it worked. When I get a month, I’ll try to keep up with your pop-culture command. Great news on PK Myers. That seems like a smart expenditure given the Hawks’ proneness to close scores. But does anyone know how his open-field tackling is? Even if he’s a speed bump, he tops Seabass.